Does the thought of tearing down your holiday decorations stress you out? Proper storage of holiday decorations can save you time and hassle, so consider it a pay-it-forward pursuit, and set yourself up for success for next year’s decorating efforts by packing up properly now. This goal alone will keep you motivated and prevent you from hastily and randomly stowing your things in bins and boxes. 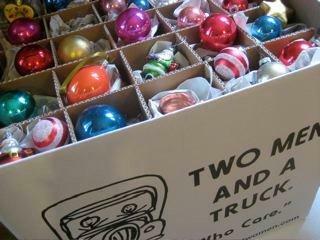 TWO MEN AND A TRUCK® has some helpful tips and tricks to make storing your holiday decorations easier. Get organized – Before commencing the pack-up process, take some extra time to sort your items. Once your holiday décor and related materials are sorted, boxing them up will go much more quickly. TWO MEN AND A TRUCK® has a variety of boxes tailored to your packing needs. Some unique boxes include a dish pack box with inserts for your Christmas tree ornaments. You can adjust the inserts to the desired size making it perfect for the large and small ornaments. We also recommend using the TWO MEN AND A TRUCK® dish pack box to store gift-wrapping supplies. The full instructions to utilize the box are here. Manage lights and garlands — As you coil delicate lights and garlands, take extra care since they tend to tangle easily. Repurpose an old paper towel roll or a piece of cardboard and wrap the lights around it. Protect the bows – Christmas ribbons and bows are commonly the items which get damaged the most in storage. To prevent them from warping and wrinkling, cut cardboard tubes and wrap them with paper towels so they fit snugly inside. Then place all the bows flat in a box together to ensure they lay flat and smooth amongst heavier items. Label everything – Nothing is more frustrating than searching through box after box looking for one specific item. Make this process less frustrating and time-consuming by labeling items found in each box. To make the unpacking effort a breeze the following year, consider labeling the boxes in the order they should be opened. Choose the order that makes the most sense for your natural holiday set-up plan (e.g., room by room). Protect Christmas linens – Christmas linens are commonly forgotten items when considering your Christmas storage plan, but if you take a little extra time to store them, it will prevent nasty surprises next year. First it’s important to pack them in a proper storage container like a suitcase or a waterproofed box to protect them from moisture. Then, place your favorite scented dryer sheet in-between the linens. This will repel moths while keeping them fresh and smelling wonderful for next year. This process only takes a couple minutes, and your guests will love the extra care. Breakable Items — Christmas plates, platters, ornaments, and other breakables need to be handled with care. No one wants to open their Christmas decorations next year and find half of their ornaments broken, so it’s imperative you pack them well. The most important tip to remember is to wrap the breakables with a few layers of newspaper, paper towel or whatever padding in which you choose to wrap your items. It’s never a bad idea to put layers of extra cushion between your items to ensure more padding. Hire moving muscle – Are you not looking forward to moving the heavier items back to their spots? Give us a call to schedule your internal move. We are happy to rearrange any heavy furniture as our movers are professionally trained and will move the same piece until you are happy with its final resting place. Do you have any packing tips which have saved you from the hassle and time-consuming storing process? If so, please comment below to share your ideas with us; we’ll incorporate your best practices into future blogs. TWO MEN AND A TRUCK® is here to move you forward with any packing tips and challenges you may have.